"When I woke up today early I was feeling OK, and my mind was back again, and I said, 'OK, this is a good day for a nice race.' I could not tell how my body was going to be today after a long travel here, but I am happy because I did what I didn't expect." - Lineth Chepkurui after running the #6 all-time 10km time in the world Saturday at the Crescent City Classic. 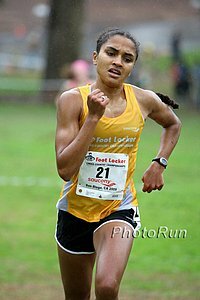 Less than a week ago she finished 5th at World XC behind Tirunesh Dibaba in Poland, but got enough rest to run 30:45 and finish only a few seconds behind some of the elite men on the streets of New Orleans. For what reasons can you get DQ'd in a race? 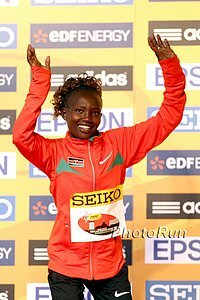 This week we give props to Joseph Ebuya, pay homage to the man who invented running in Central Park, talk about how ridiculously stacked the SEC is, are inspired by the minds of two champions (Usain Bolt and Bernard Lagat) worry about Asbel Kiprop and talk about the women's 800 stars of 2008 (Pamela Jelimo) and 2009 (Caster Semenya). Mike Hurst Points Out Semenya Or ASA Defying IAAF Could Jeopardize Other Athletes *2nd update: this rule still stands (earlier Hurst told us the IAAF had changed the rule but then he found it in a different place in the IAAF rulebook). So Amazing, It Almost Sounds Like An April Fools But It's The Actual Truth: World XC Champion Joseph Ebuya's Dad Didn't Watch World XC As He Was Up All Night Trying To Keep Elephants From Trampling The 2.5 Acres His Son Had Purchased For Him Even if he was able to watch, it would have been hard as he doesn't have a television. See the highlights or listen to the audio of our talk with Ebuya's coach and manager Ricky Simms joined by coach and 2000 Olympic champion Noah Ngeny. New IAAF "Entourage Commission" Led By Sergey Bubka Will Examine Doctors, Physios And Coaches Accompanying Athletes According to one of our sources, the IAAF is trying to figure a way to hold coaches and doctors responsible if they have anything to do with athletes doping.